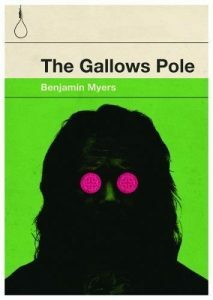 The Gallows Pole is the true story of King David Hartley and the Cragg Vale Coiners. It is both a history from the perspective of those who lost – in that the clipping and forging of coin for local benefit was stamped out by the establishment – but also a novel that enlivens a sense of the untamed landscape of Northern England in wood and moor just before the industrial revolution with its mills and mines and factories took hold. David himself, the self-appointed King of the North, mourns an older, wilder landscape filled with wolves and his relationship with the woods and moors has a mystical quality. He sees the dance of the deer-headed men, feels the secrets of the land single him out for their mythic poetry. This connection to the land is one of the most pleasurable parts of the book. You can feel the breath of the landscape, hear the movements of creatures hidden within the trees and rocks and rivers. Setting really does live and breathe in The Gallows Pole. This visceral description of the land carries over into the interactions between people too. There is no shying away from the brutality of this history – its hardships and violence. As well as the story of how the coiners grew, what motivated them and how they were captured – giving some insight into how they were viewed by the establishment – The Gallows Pole also gives us passages from King David’s own writings written during his stay at York Jail. The language uses older spellings, specific words and phrases that evoke the English of the time and cleverly juxtapose an individual story against the wider record, giving us that sense of the dip and weave of history, of how an account of ourselves might vary from an account given by others. In this is the real sense of the novel’s drive: no history tells the whole tale. David himself writes about being motivated to write to set his account against the history of the victors. And yet the beauty, the soul of the novel, is in the way we are made to feel that the land remembers and is steeped in the loses as well as victories of the past, waiting for us to come back to a more symbiotic relationship with it. Poetry, in language and as a concept of creative beauty in word or deed or spirit, is something that shines through the blood and grime of the fraudsters of the North. Compelling and beautifully told, The Gallows Pole more than deserves its reputation as a modern classic. Thank you the wonderful independent Bluemoose Books for bringing different voices like Benjamin’s into the wider world. Next, I’ll be reviewing something totally different, the debut thriller from Harriet Tyce, Blood Orange.